UFW Stories: "Cesar Chavez Name lives on in Nebraska!" "Cesar Chavez Name lives on in Nebraska!" Since the time back in 1971, when Cesar visited Kansas City, Missouri and led us to a Safeway store in protest over the sale of non-union produce, I have continued en “La lucha”, fueled by Cesar’s self sacrificing example of service to La Gente. To keep his name and his story alive in the community mi esposa, Linda and I have made countless presentations and promoted events about Cesar and his struggle against inequality, pesticides, low wages and social inequities. The photo sent is but a meek example of what Chicanos are doing in Nebraska to carry on the work started by a great Man, Cesar Estrada Chavez. 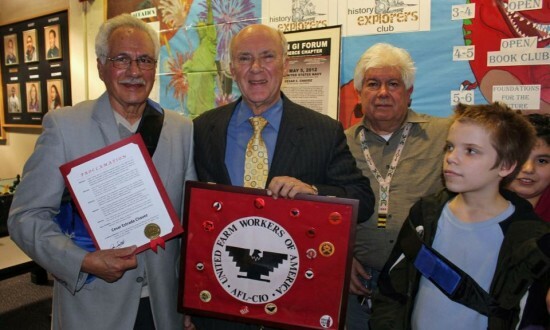 In Omaha, Nebraska, March the 27th was proclaimed “Cesar Estrada Chavez”, day by Mayor Jim Suttle. In the photo to his left is Abelardo Hernandez, un Chicano de buena mata, and to the Mayor’s right is Jose “Chato” Garcia, founder of the Mexican American Historical Society of the Midlands, the writer of this story. The kids shown represent the youth we bring Cesar’s story too and they represent hundreds of kids that were in the audience ‘al otro lado’ of this photograph, taken March 27th, 2013 at the South Omaha Boys and Girls Club.